With so many devices out there, on many different operating systems, deciding which one you should purchase can be difficult. 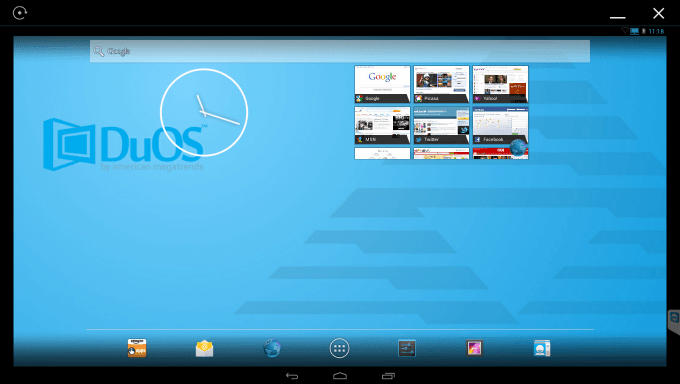 DuOS helps lessen that burden by providing an Android tablet experience on your Windows computer. Does DuOS step beyond the barriers that currently divide these OS’s, or are we still locked into one OS per device? When you shop for a portal device, there are several models on the market for you to choose from. One of the choices you are locked into is the operating system provided; however, a common problem a person will run into is an app that will run on an Android device but not on a Windows device. There is, of course, dual-booting. But what option is there for the less tech-savvy among us? Fortunately for Windows users there are Android emulators on the market that make it is as simple as installing any other program out there. The AMIDuOS, or DuOS, is one such offering. The developer has been involved in the PC market since 1985 but you might better recognize them by the company’s full name, American Megatrends Inc. A company that has been an industry leader in BIOS and Storage Controllers, American Megatrends Inc. is now branching out into the emulator business. The system requirements for DuOS are not very hefty, asking only for Windows 7/8/8.1 in either 32 or 64-bit flavor, a video card that supports OpenGL 3.0 or better and 2GB of RAM, and some hard disk free space. The only non-negotiable requirement is that the machine must have an Intel CPU. The reason for this is that the emulator takes advantage of Intel’s VT-x, better known as Intel’s Virtualization Technology. This limitation holds back AMD users in a big way though it might be necessary to get the best experience, something I will touch on a little later. I have tried other Android emulators and none bring as many features to the table as DuOS does. 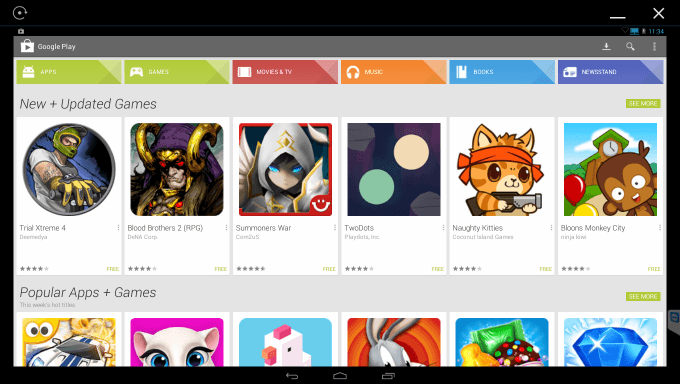 The user can take advantage of both the Amazon App Store and Google Play Store. It has an option to configure input controls for game pads to control your games. It can utilize up to 16GB of HDD storage space but the space won’t be used until you install the apps. It is ARM V7-compliant so it can run almost any ARM application. You can root the emulator with one simple click. You can also share files easily between Windows and DuOS. Finally, it provides gesture support through keyboard shortcuts for those on desktops. I mentioned before that DuOS is limited to Intel CPUs and said it utilizes these specific features to provide the best performance and compatibility. My assertion is based on my experience with Bluestacks, an emulator that does not have this requirement. At the time I was running an Intel i7-950 with a NVIDIA GTX 580 and every 3D app or game ran very poorly or would crash outright. It also booted up the emulator very slowly. I ran DuOS on a Intel Core 2 Duo E8600 with a NVIDIA 210 and it ran 3D apps very smoothly. It even booted up the emulator very quickly. There can be many other reasons for it running more efficiently but when I looked at the forums I noticed that many other users had a similar positive experience and they could even run apps they couldn’t get to run on other emulators. As a current AMD user I want to cry foul here but I can’t deny the benefits myself and others have experienced. The developer has mentioned they are looking into making DuOS compatible with AMD CPUs but there is no timetable for when that will happen. Where DuOS suffers the most is its basic features and introducing the user to the product. After you install the application some information is provided via a webpage that includes how to install the Google Play Store, the keyboard shortcuts, how to root the device and where the shared folders are. What it does not tell you is that the shared folders only show the files in that root folder; anything in a sub folder will not show up. The only interactive buttons DuOS provides is rotation, minimize and exit at the top. There is no indication to let the user know if they’re zoomed in or if a keyboard shortcut is enabled. There is no Help section in the app, so users have to go to the website forums to find what they need, even basic items such as keyboard shortcut reminders. There is no auto-update; users have to sign up to the newsletter and then manually update the program. In the end, At a price tag of $9.99, DuOS brings users a well-performing Android emulator that still needs a lot of work done on some basic features. If this wasn’t lacking AMD support and provided better instructions on its features, it would be a no brainer to recommend it to everyone but because it doesn’t I will only recommend it to those who have an Intel CPU and do not mind a mild learning curve. Amazon and Google App Store. Only supported on Intel CPUs.